Cornbread is a traditional American accompaniment to a meal or barbecue. It was originally made by native Americans before the introduction of wheat, rye and barley to the country and was adopted by the settlers that moved there. It’s main components are cornmeal, buttermilk and eggs with the addition of baking powder as a leavener. American cornmeal can be tricky to come by in the UK so look for italian polenta which is the same thing. Make sure you buy coarse polenta and not the instant packets. Cornbread is traditionally made in a cast iron skillet however here we give a recipe to make it in a loaf tin at home. Traditionalists would make the bread with 100% cornmeal which gives it a denser consistency. 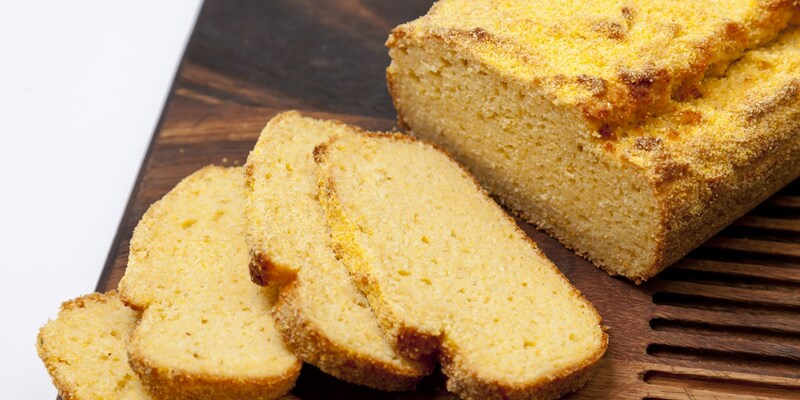 There are many variations of cornbread in the US; a savoury version is preferred in the south while the northern version is generally much sweeter. Adjust the amount of sugar in the recipe until you find the perfect sweetness for you. Jalapenos can be added to cornbread for an extra kick and sun-dried tomatoes would also work nicely. Cornbread can be eaten with soups, stews and chilli as well as barbecued meats. You could try it with bacon and eggs for breakfast and some people also like to eat it with honey and butter.